Francis William Kere a.k.a FATBOI is a rapper,singer and song writer signed to SERENGETI MUSIC RECORDS. This multi-talented artiste's journey into music started way back when he recorded his first ever single with the legendary producer OJB and since then this young and extremely gifted artiste has never looked back. Fatboi's rise to relative prominence took a favourable turn when he featured on beatfm's (NIGHT OF THE LIVING DJ) CYPHER alongside other prominent rappers like PHENOM,LOS,YUNG6ix and others where he against all odds went on to end up in the top 3 finalists alongside OZZY B and veteran mc T-Rexx. He has worked with various artistes including VECTOR,PHENOM,PETER CLARKE,JOSH BEATZ,HAKYM,MISCHIEF,SLIM T,MUDINAH and a host of others. Fatboi also holds the record for being the only rapper to have ever been on DJ JIMMY JATTS Jumpoff thrice without having released a single. His new single 'DREAMING' is the first official single since signing to SERENGETI which happens to be the former label of HAKYM and GODWON. Dreaming is a different kind of a song,Fatboi breaks away from the norm of up tempo beats and dance tracks and takes the listener on a journey from his relative obscurity to relevance.Dreaming is a hip-hop track with RnB/soul vibes and he does a great jon of singing on the hook as well. 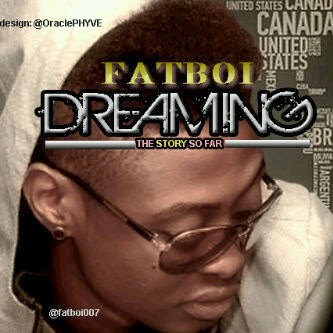 Fatboi who has often been compared to artistes like drake,delivers a great song and great visuals also in the video. He is definitely one to look out for in the near future.